Almost every village and town in Norfolk put up a memorial to the dead of the First World War. If this were on consecrated ground – in the church itself or in the churchyard – a faculty was needed and the record of this will be preserved among the diocesan records held at the Norfolk Record Office. The faculty papers may include supporting papers, such as those for Cromer, which reveal a local dispute as to the form and siting of the memorial. There was often a local War Memorial Committee and its records may survive, often with the parish or parish council archives. These can show who paid for the memorial and, occasionally, record decisions as to whether or not an individual name was to be recorded on the memorial. 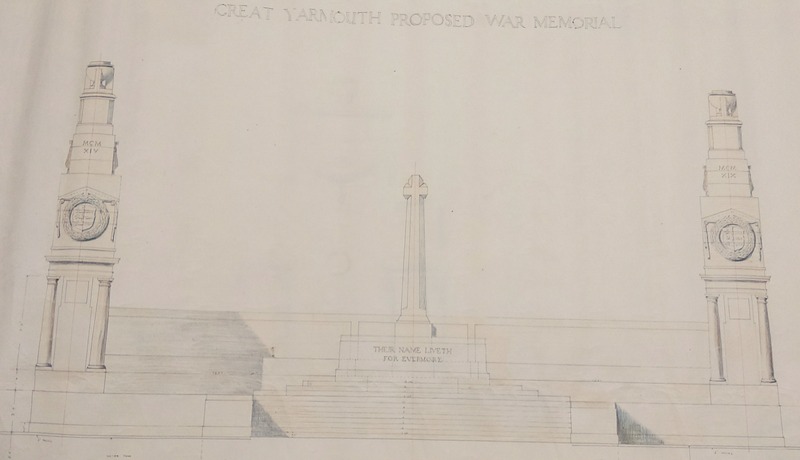 The large towns, naturally, had ideas for grander memorials not always fulfilled: the intended memorial at Yarmouth was designed by the creator of the Cenotaph in London, Edwin Lutyens. Unfortunately, sufficient funds could not be raised in the town and an alternative design by a local architect had to be adopted instead. 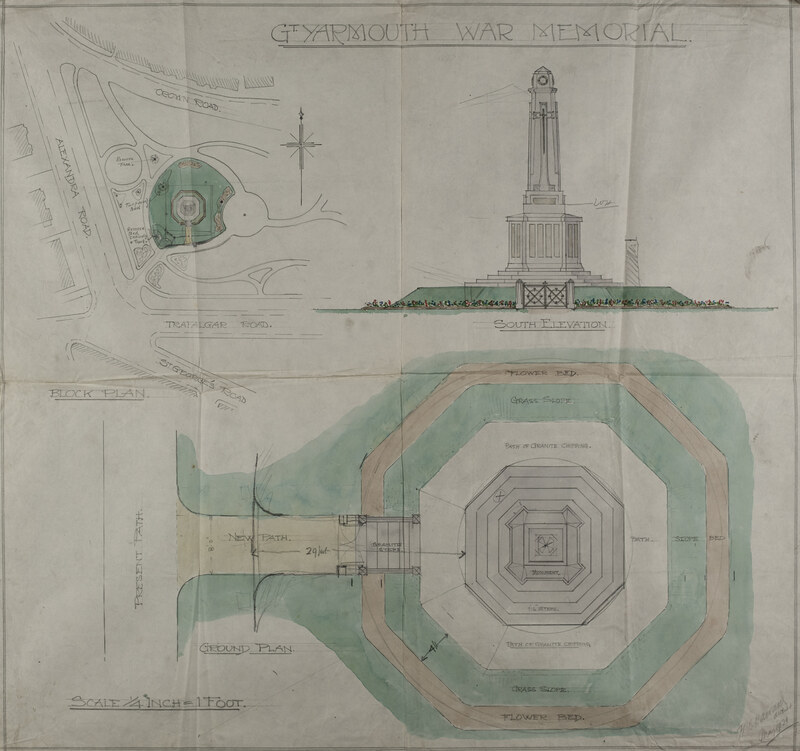 Lutyens’s design for the memorial in Norwich was however adopted: the memorial was originally beside the Guildhall before being moved to its present site in front of City Hall. After the Second World War, the same memorials were very often also used to commemorate the new heroes. Again, there are faculty papers for memorials in churches or churchyards. For example, at Kenninghall in 1947, a War Memorial Committee proposed to place a stone tablet in the parish church: it was unanimously decided that a memorial of simple design bearing just the dates 1939-45 and the names of the fallen would be the most suitable memorial to be placed under the 1914-18 one. Seven names were to be placed on the tablet, with their ranks and the arm in which they served. Where the original memorial was a cross rather than a plaque, other solutions had to be adopted. At Ludham, the First World War memorial consisted of a granite cross on a stone step. It was decided to dismantle it and re-erect it on three stone steps, on which the names of the dead could be inscribed. One striking difference between lists of names is that it is most uncommon to find females on the First World War lists, but those of the Second World War will include members of the three female arms of the services. Some memorials, such as that at Yarmouth, also include victims of air raids, both male and female.